The mill began operations each spring about April, depending upon the snowmelt, and closed up for the fall around late October, again depending upon the weather. The mill began operating earlier than the woods crew sawing “decked” or stored logs piled up in the mill yard the previous fall. The heavier snowpack in the forest further east prohibited early access for the woods crew. Just before the mill began operating every spring the open pile of sawdust and scrap lumber was ignited again and that open fire burned until it was covered with snow in the winter. No teepee burner existed in 1955 and it didn’t appear until years later. Instead, smoke and fine ash drifted with the wind, into houses through open windows, covering cars parked nearby and generally making its presence known. Single men lived in the bunkhouses; each bunkhouse accommodated four men, one in each corner. All they had to do was throw their suitcases under the cot and they were home. The shower and toilets were close by and the cookhouse down the hill. The door was in the middle of one end and the stove in the middle of the room. Families lived in cabins and housing was assigned by Leo Chase the camp clerk, and was based on length of service, and in the early days by ethnicity. Once a family occupied a cabin it was theirs for as long as they worked for Pine Logging or until a newer cabin was built for them. 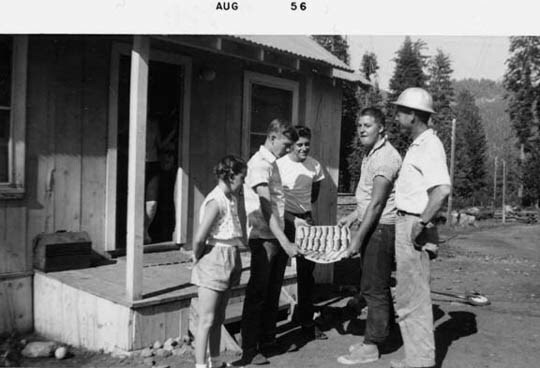 Rents averaged about $5/month for the older cabins and $10/month in the 1950’s, although when a new cabin was built for the longer standing employees their rent didn’t necessarily increase. Many families moved up to camp and opened their cabins when the mill or woods crew began work. Some children attended school in the one room schoolhouse at the mill, but other families chose to keep their children in school in the valley and move to camp at the end of the school year. The schoolhouse was in the middle of the camp. Although the camp was seasonal, many of the same families returned to camp for decades, thus many the families were well known to each other. Most cabins had locks on their doors, but few were ever locked. The rural, isolated residential nature of the camp with only two roads into & out of the camp provided its own security. Camp residents were well known to each other and a stranger driving into camp was closely scrutinized, although mostly out of curiosity and for entertainment. Furthermore, the wives were usually at home and few items of value were in any of the cabins other than tools, and each man’s set of tools or chainsaw was well known by the others. The cabins were not insulated and heating for the cabins during the cool spring and fall days came from wood cook stoves and/or oil barrel stoves. An oil barrel stove was made from an old oil barrel put on its side with metal legs attached to the bottom. A hinged door cut into one end for feeding wood to the fire and a hole for the stovepipe was cut into the back of the top. The first class stoves also had a cut down flat section on the top where pans could be placed. Scraps of lumber from the mill were used to fuel the stoves. A prized item to decorate the stove was a "Mack" bulldog from the front of the Mack Trucks. They disappeared off the new trucks immediately. The large diesel engines powered only the mill equipment and so until the 1950’s the power supply for the cabins wasn’t entirely reliable. At first there was no electricity for the cabins and then electricity was sent over from Shaver Lake on a line running through the trees, usually attached to a tree. By 1955 there was a more secure set of power lines running to the mill, but there were a lot of trees along that line and everyone kept a kerosene lantern at hand, especially during a storm. Thunderstorms almost always caused power outages. The shower house that was located next to the bunkhouse provided hot showers and flush toilet facilities for the men. Until the women’s shower house was built in the early 1950’s the women were able to shower in the men’s shower house during specially designated women’s hours in the early afternoon. Until the modern (electric or propane?) heaters were installed, the bull cook would stoke the wood heated hot water tanks in the afternoon. The hot water was available for the women/kids during specific hours. Usage was supposed to be limited so there was enough for the men when they got off work. Occasionally the men complained that someone had used too much of the hot water during the family/women time period. In 1955 all of the cabins had electricity and running water and many of them had a flush toilet. If a cabin had a flush toilet then it had a cesspool dug into the ground. Cabins with water only to the kitchen sink and outdoor shower hut usually just drained the water outside down the hill. The dump was located down the hill from the road that turns off the Dinkey Creek Road, just about straight down from where the yellow metal gate is today. All the refuse from the homes and from the mill was dumped there, either in the “wet/food” pile or the trash area. The road to the dump was the longest in camp and so young teenagers learning to drive cheerfully delivered residents garbage to the dump for them. 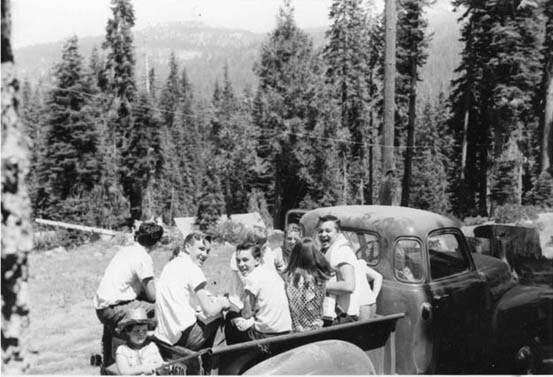 Since the camp was located on private property it was legal to drive around the camp without a driver's license, many of the teenagers took full advantage. What did the women and children do in 1955? What was the daily/weekly routine at the mill? One note about the road leading down into Pine Logging off the Dinkey Creek road: In 1955 that road was very much more-well traveled than the Dinkey Creek Road that extended on down to Dinkey Creek and the campground. It wasn’t unusual for a tourist to mistakenly take the turn down that well traveled road to arrive at the mill site, very confused. Evenings were shortened by the day’s hard physical labor but after a 5:30 dinner there was still some evening time to be filled. In the 1950’s during the summer months there were twice weekly movies that were shown on an outdoor platform that was built up over the granite rocks at Camp Ducey. A weekly baseball game was started between the two lumber mills, first with the men, then a children’s game and sometimes a women’s game developed. Fishing was always popular and it was possible to find a craps game on the deck of the old office. Saturday was payday and at that time there were two well-populated bars in the area, one in the hotel at Camp Ducey and one at Andersons (Dinkey Creek Inn). Both were popular, both had jukeboxes and both had the occasional fistfight. At Shaver Lake, Johnny’s (now Trappers) restaurant and bar hosted a dinner and a dance, complete with a live band on Saturday nights, and there was the occasionally dance on the open air platform at Camp Ducey.